In inventory control, it is often useful to distinguish between two separate phases: first, the anticipation of future demand, i.e. demand forecasting; and second, the optimization of quantity to be re-ordered depending on the ordering constraints. 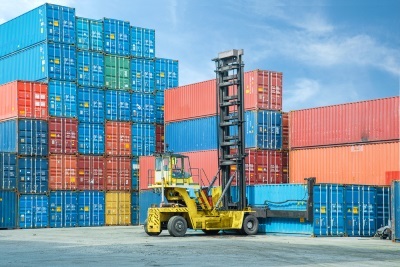 Container shipments represent a supply constraint typically encountered when importing goods. In this brief, we detail the methodology can be used to re-order goods when dealing with container shipments while leveraging demand forecasts. Let us assume that Contoso, a fictitious Canadian retailer who imports goods from China, is relying on container shipments that take place roughly every 10 weeks. Since allocating a container is expensive, Contoso expects each shipment to be made with a full container in order to maximize capacity. At the same time, Contoso also expects to hold the minimum amount of inventory both on hand and on transit while preserving its service levels in order to keep its customers satisfied. The second point is very much a standard component of inventory optimization and remains true regardless of whether inventory is shipped through containers or not. Container shipments are inherently constraining and can potentially create two problems. First, whenever considering a re-order, Contoso needs to assess whether any given container will be at capacity or not, or in some cases, even overflowing. Second, the lead time, becomes somewhat unclear owing to the fact that it depends on the future demand. In fact, an increase in sales would also reduce the delay until it becomes opportune to trigger the next shipment, while a sales slowdown would, on the contrary, delay the next shipment. In addition, the duration between two container shipments should be estimated in order to allow the forecasting process to produce a forecast adjusted with the correct lead time. In reality, Contoso does not even require to know the “dates” of shipments, but only needs to know the timeframe until its next shipment provided that a shipment was triggered today. The date of the next container shipment is a forecast of its own. In practice however, few forecasting solutions would actually provides a built-in forecast for this value. However, Contoso knows by experience that container shipments take place on average every time that an X amount of goods is sold. Manually forecasting the demand for thousands of articles is extremely tedious, but estimating the next container shipment with an Excel sheet compiling weekly sales over the last three years and the date of the corresponding shipment is relatively straightforward. Here, Contoso is looking at the total weekly sales which are a relatively smooth time-series. Two factors, one for seasonality and one for the trend, are also used. The seasonality factor is computed by simply looking at comparable periods over the previous years. The trend factor is an input which is devised together with the marketing and sales departments who generally have deeper insights vis-à-vis the high-level evolution of the market (*). As the forecasting process only requires a single duration to be calculated, Contoso has a process in place whereby the most probable duration between two consecutive shipments is manually revised every week, which only takes about 20 minutes with a small Excel sheet. (*) Such a process can be applied in this instance for the estimation of shipments because Contoso is looking at its total weekly sales. Thus, most erratic behaviors are completely smoothed out, and total weekly sales are a relatively smooth time-series with a clearly visible seasonality. If sales at the item-level had been considered instead, such a process would have led to poor results. Also, as there is only a single duration to calculate, it is acceptable to have an expert spending a non-trivial amount of time polishing the estimates. If the same process was to be applied at the item level, then most likely, the practitioner in charge of the forecasts would spend less than 30 seconds on each forecast, and the resulting accuracy would naturally suffer. At the beginning of every week, once the most probable duration between the two next shipments is estimated, Contoso can compute the applicable lead time as it is defined by Lokad. The Lokad lead time is computed by taking into account the duration between two consecutive shipments plus the shipping time itself. In this case, estimated delay between the two shipments is estimated to be 10 weeks and the shipping delay from China to Canada is estimated at 5 weeks. Thus, the Lokad lead time is (10+5) x 7 = 105 days. if classic forecasts are used (eg. weekly forecasts), then the expected demand is summed over the lead time, and on top of this sum, a safety stock is added too. If the total goes - minus stock on hand and stock on order - goes above the container capacity, then a new container shipment is ordered. if quantile forecasts are used, the process is very similar, except that there is no safety stock involved: the safety stock is already integrated with the quantile estimation. Again, it's a threshold process, once the container capacity is reached, a new container shipment is ordered. if a quantile grid is used, every time the forecasts are refreshed, the container is filled up-to-capacity through the purchase priority list. Then, economic indicators should be made available to access the profitability of container shipment as it stands. Once profitability reaches a certain threshold, a new container shipment is ordered. In practice, whenever container shipments are present, we recommend a forecasting process based on quantile grids, as this type of forecasts offer a much greater affinity to supply constraints.